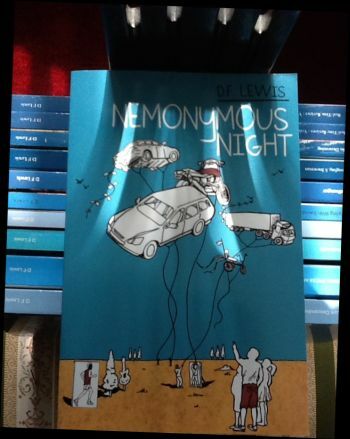 NEMONYMOUS NIGHT | DF Lewis as editor, publisher, writer and reviewer of fiction, plus hawler and synchronist. 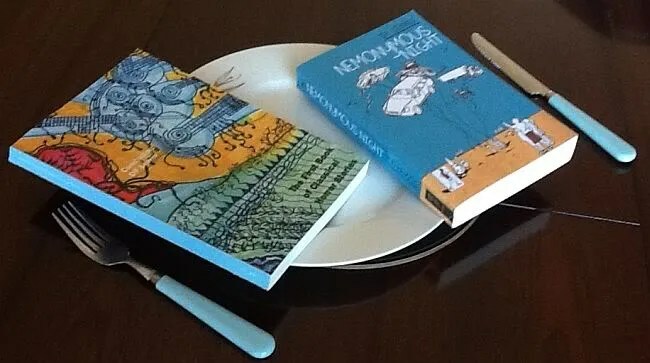 These three novels were the base material for my distilled novel NEMONYMOUS NIGHT (Chomu Press 2011). These novels were written in public on piecemeal blogs over the period 2005/6. (2) Orthogonal is seeking high-quality fiction stories. 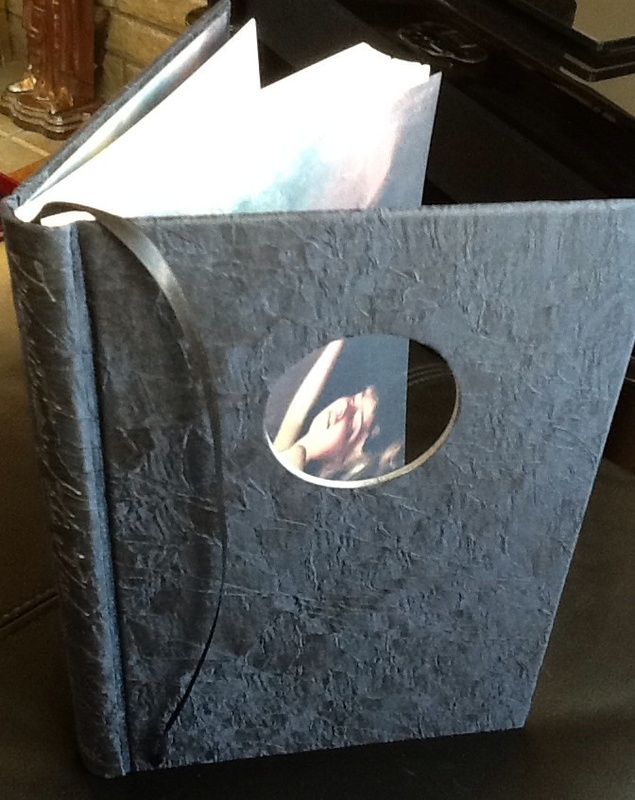 Orthogonal will be a “megazanthus” – a composite of anthology and magazine. Because this project is inspired by D.F. 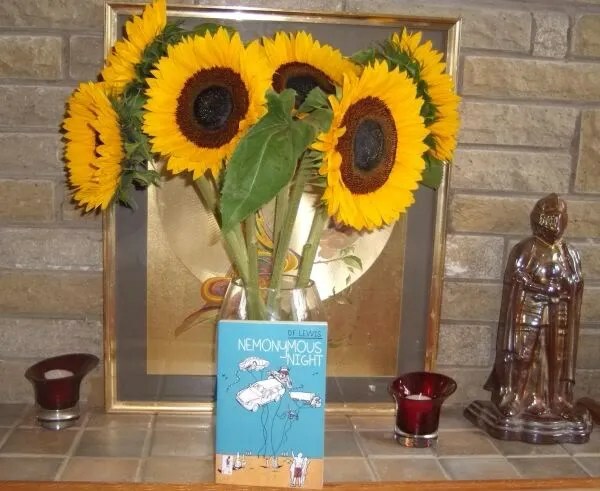 Lewis and his publication Nemonymous, all submission must be anonymous. An extract for the self-commentary of the book HERE. Ogdon sat on the customer’s side of his pub’s bar, staring into the decorative mirror behind the gleaming shorts and their optics. The reflective glass had the word C – O – U – R – A – G – E etched in swirls of artistic lettering at the top of the mirror: an advert for one of the bitters that were sold there. Ogdon could see his own face lower down between a bottle of rum and a bottle of vodka. But it wasn’t his face but that of a Spanish playwright by the name of Lope de Vega who, Odgon always thought, was the author of “La Vida Es Sueño”, but he also thought William Congreve had written “She Stoops To Conquer”, so whether Ogdon was correct about any literary matters was anybody’s guess! In any event, he imagined a dialogue between himself and the reflection in the mirror. There was nobody else to whom he could talk – the barmaid (a replacement for Susan) being down the other end of the bar and she didn’t seem to have anything much in common with Ogdon – and she freely admitted to being a fan of the ‘Big Brother’ TV show and other Soap Operas. And it was now that no-man’s-land of time between popular drinking sessions: and next to no customers were present to listen to his pub small-talk. Ogdon: There is one people carrier. O: Yes, a human being who’s infecting the birds with a virus, and not vice versa. R: Now that sounds possible, but how do you know? O: Well, the birds are becoming more like red meat than white poultry-flesh when you cut them open. R: As if they’ve got an animal disease? O: Turning them gradually, from a bird into an animal or half and half. And they’ve caught it from us humans. Or they have just started to catch it from us humans. That’s why many of them can’t fly any more and only hop about. Their whole essence is somehow corrupted. R: So, they don’t need roofs to aviary cages any more in the zoo? Makes you want to cry. R: Really? What do they call it? O: Like all gods in religion, the birds know it with different names or no name at all. R: If it’s got no name at all, what do the birds think of when they think of it? “It remains to be seen,” answered Ogdon, now forgetting his own point or why he had started the topic or even the whole topic itself – as if he had simply been doodling with words and concepts … in the composition of an abstract poem. If he thought the destiny of the whole world depended on the outcome of his thoughts, he would have been more careful with those very thoughts or just tried to be less thoughtful altogether. He returned to his thoughts, desperately wanting the people who were caught up in these thoughts of his to be believeable, sympathisable figures: because, if not, there would be no way that the conflicts in store for them would be sustainable conflicts at all. These people were in danger, he thought, of becoming mere ciphers acting in a game, or a dream, or a lie. Little did he know, however, that the people themselves (Mike, Greg, Susan, Beth and so forth) – currently on the brink of enormous human significance – were essentially real: tangible bodies with flesh and blood, owning minds that could be hurt or filled with joy, thinking thoughts that could be clarified, confused or defused. Meanwhile, by comparison, he, Ogdon, was the emptiest cipher of them all, less real even than his own reflections. Hence, the sheet of paper. One viewpoint is that his dream is separate, insulated, uninfecting and uninfected. An alternative viewpoint would be that the dream itself – this we read – was infected from outside. Or, yet, as there always are three alternatives, the dream itself infected other dreams, other realities. The daylight firework-display on the open plateau of the Left Foot Region was indeed a sight to behold. 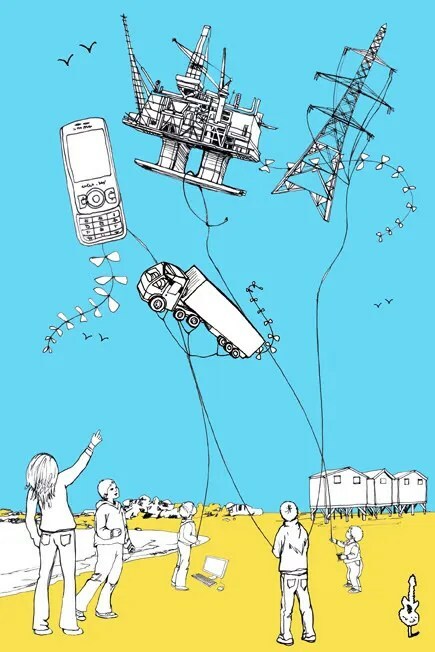 It was intended as environmental context for the Drill’s ‘lift-off’. The bright primary colours of each of the individual swellings or plumes of flame, their sprays, cascades and visible thunderous bangers were so sharp-etched, sharp-edged, they seared to the very optic fuse of one’s retina. The wide shiny blue sky faded by comparison. Some of the colours were not colours as such but various shades of black, many being utterly black slices and slashes of display – accentuating how faded the sky’s otherwise bright backdrop had become. Meanwhile, the revving throbs of the Drill’s engine took sway as the sunlight sparked off the fast-revolving bit-tip at the Drill’s lower leading-edge. The pilot could be seen grappling with the controls in his cockpit as the bit-tip finally met the beachy terrain beneath it with a sickening crunch – both the bit-tip’s self-induced sparks and the crunching noise now outdoing the firework display which had previously outdone all else. Ogdon turned from the mirror and busied himself with more pressing duties that the current Happy Hour in his pub had created. Mike reached the area on the horizon (a horizon now turned into the hard-rippled ground beneath his feet) where the rest of his party seemed – at the previous distance from which he had viewed them – to have slowly sunk from sight. The others had, in their turn, been pursuing two stick-thin figures of child-size that, it was assumed, were the stolen or missing identities as children of Amy and Arthur who were also in the same party pursuing the same figures. Mike’s wife Susan and her teenage daughter Sudra were also in the party, so Mike panicked when thinking that something evil had befallen them. He could not remember why he was so behindhand with his own pursuit. Any possible quicksand needed to be respected by means of a slow approach to its suspected whereabouts. He had shouted out warnings to the others. However, there was no sign of quicksand at this headpoint in the northern coalfields. The sky had, by now, grown even darker and he wondered how dark any sky could possibly grow. Was there a black blacker than black? Despite this, there was a thin effulgence which picked out an untidy mound of what appeared to be old stiff and rumpled carpet in the vicinity of where the others had last been seen. That was the only way he could describe the sight before gingerly approaching the odd crumplings to investigate what it was and whether any blackness could exceed any other blackness. This and different rhetorical questions buzzed through his head, some relatively sensible, others completely crazy or off-the-wall – and he felt himself desperate in not being able to differentiate the crazy from the sensible. At that sudden point in his thoughts, all the teeth clamped and became (or felt like) a flickering hinge of two scooped out bones. Soon, however, the storm of thoughts subsided and Mike became worried again about the others in his party. There was a gap in the blackness of the ground beneath his feet; he lowered his head to peer into the ragged aperture. He sensed it was merely an oubliette of vacant earth – so he was amazed to find a further sense that followed the first sense indicating it was the start of a shaft that reached beyond any conceivable depth possible within the context of earthen tunnel-able dimensions. When did depth become height? Another question that was soon forgotten when he saw, in the thin effulgence, that there was a spiky hedge filling the gap in the ground – and, at the back of his mind, he somehow recalled the time when he had first encountered such a hedge, needing to thread his own body through such a tangled mass of twigs and sharp leaves. But, then, it was a horizontal hedge which grew along and from the surface of the ground. This new hedge was a vertical one; he knew instinctively it would be relatively easy to push aside and penetrate its nettly growths in a downward path – but if he changed his mind and tried to come back up through the hedge, such growths would have closed ranks, changed points of direction, with each spike jagging against the matted grain, making any escape impossible. He heard the other’s voices below him from within the hedge’s ambit but he could not judge whether they called for help or for him to join them in the renewed pursuit. Nor could he judge if they had fallen accidentally through the hedge that had opened up its scratchy spindly arms to welcome them into the undergrowth (in the true sense of that word) or if they had jumped with joyful shrieks into its enticing knots of wood-nymphs. His mind was evidently still trying to play tricks on itself. At least all this explained the stick-figures that had tempted them this far. Explanation, however, is not a two-way filter. It is hard to reconcile the earlier characters of Mike, Susan, Sudra, Amy and Arthur with their later madness in undertaking such a downward search. Mike had soon faced this conundrum even more starkly by investigating the so-called crumply mound of ‘carpet’ only to discover it was a pile of discarded clothes. All of them had indeed needed to take off their clothes to be able to slide with greater ease through the hedge-filled tunnel as the spikes would have otherwise snagged on the teased and worried material of even underwear. Therefore, they spent their first sleep-stop completely naked (it couldn’t be called ‘spending the night’ as the thin effulgence that seeped through the tunnel was uniform, thus not being able to differentiate between seasons of time), but they had managed by then to re-establish their personalities, inhibitions and vulnerability to fear – just like the real people that they had been when first walking through the city zoo, certain then what was dream and what was not dream. This hedgy drop was another area – as with the zoo – where one could be oneself without fear of becoming other than oneself. Not confused by what was real and what was not real. By what was and what was not. But don’t forget when they were in the zoo, someone, for whatever reason, left quite unreported one of the sights they saw in a cage just before leaving the zoo! 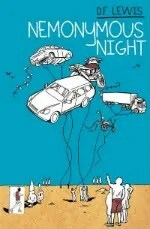 I thought it was high time, distant time, to give some real-time dreamcatching objectivity to ‘Nemonymous Night’, a novel that was drafted piecemeal in public during 2005/6 and revised by me for publication with Chomu Press in 2011 (my first and last novel)… I may now hate it! This novel by DF Lewis was published by the acclaimed Chomu Press in 2011. It has something to do with Clacton-on-Sea in Essex, where the author has lived for 20 years. 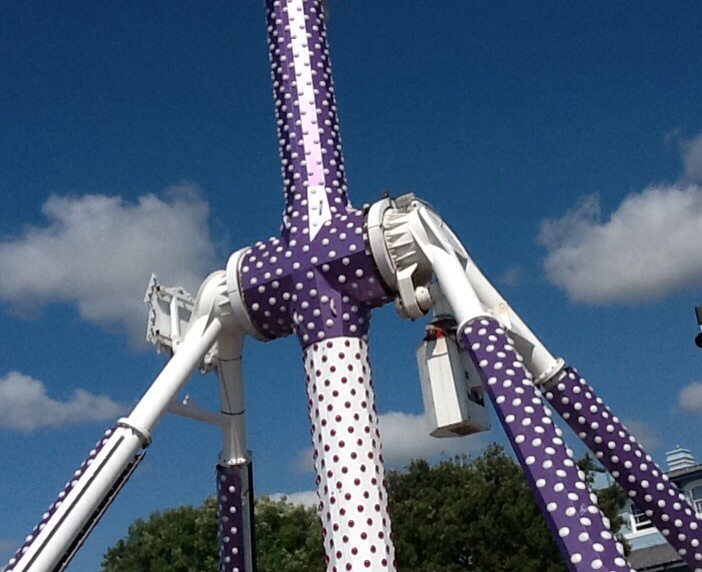 Now Clacton is about to go BIG. Possibly not as big as the novel itself, though. You have been suffering with dream sickness, and a Hawler has suggested you take the sea air for a rest cure. Perhaps you have been strolling along the promenade by the sands of Clacton-on-Sea, wondering whether your life is a dream, and if so, whether it is a real dream, or merely a dream of a dream. You put your face in the space of a seaside cut-out board and on the other side you see… a giant carpet in the wild spiral of a tornado burrowing into the earth, the weave of its multidimensional design revealing the capering of carpet apes, the things that haunt ceilings, the places where poultry becomes meat… You remove your face and find yourself back in the same day as before, with both sides of the cut-out board the same dream or unimaginable reality. But now you and everything else have together become completely nemonymous. 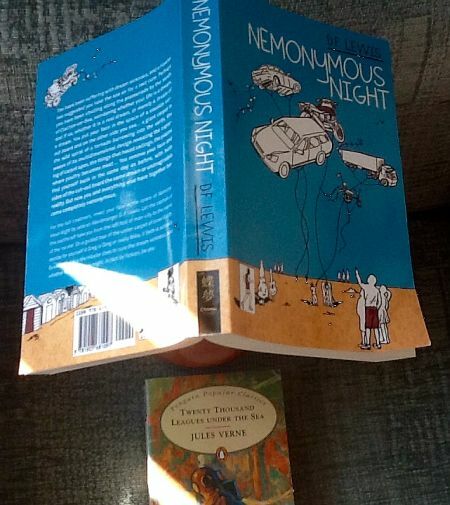 For the full treatment, insert your face in the space of Nemonymous Night by veteran Weirdmonger D. F. Lewis. Let the captain of this earthcraft take you from the left foot of man-city to the nemo of the ‘no me’. On a guided tour of the under-carpet of Inner Earth, decide for yourself if Greg is Greg or really Mike, if Beth is actually Susan, what it is the Hawler does to cure the dream sickness, and whether Mike or Susan might, in fact (or fiction), be you. Can anybody’s life be called ordinary? To the person living it, each passing moment should be all important. Even the scrubbing of a dirty new potato ready for lunch must be felt for what it truly is – a precious moment of rare life, to be cherished as a gem of priceless sparkling beauty. The voice came and went, like a bird of prey that merely pecked at my carcass, then, thinking better of it, soared back into the blue sky, blotting out the glorious sun for just a nonce. It was Christmas Day. There WAS something special in the air but, equally, it was not like Christmas Days I remembered as a child: those were so special, all the people I saw that day would seem to have a halo glowing above their heads. But today was not significantly unlike any other. In fact, we all decided to split up, get into our various vehicles and tour the local towns and countryside, before lunch, it being such nice weather for the time of year. The turkey was already “doing” inside the oven, plus the bag-pudding hissing above the steam, my potatos ready-scrubbed in their milky liquid and, finally, but not least, of course, the various items of alcoholic beverage lined up in the fridge eager for consumption. I noticed that the stuffing was still on the kitchen table and not safe inside the turkey’s gaping belly … but I did not draw attention to this, for fear of delay to our trips. Many people were out and about, and I was relieved they all looked as ordinary as myself. My own particular husband and children harnessed themselves into my car, all excitedly chatting about their Christmas presents (many of which had been brought with them on the trip, no doubt only to be discovered several months later when I got round to clearing out the back of the car). I was a great collector of secondhand books, so I’d not been given any of these, for most people think Christmas presents should be new things. Somebody HAD bought me a new paperback, but it was a science fiction novel I would never want to read, if I had not read it already from the public library. The other families staying in the same house as us for the seasonal weekend, including my own parents with their new children, drove off in their jalopies, even before I’d had the chance to start mine. We were all to return here by “lunchtime” (a moveable feast, if ever there was one). I was glad I was not ultimately responsible for its production. (Perhaps I SHOULD have told someone in authority about that stuffing). I was eager for a drink, but driving. We soon became lost in the first town we encountered (the one we were staying in). Because of the recent bomb threats, most of the roads that the public could use as short-cuts through the garrison areas were fenced off. Not all of them, since we saw soldiers toting their Christmas slop buckets between barrack-rooms in some of the less sensitive military demarcation zones. In any event, the maps were sufficiently confusing to send us on a wild goose route through the smaller town of Bulstrode. But once there, we scaled the climbing alleys, till we reached the market square. I do not know whether my family noticed it was becoming less and less like a proper Christmas Day. There were a few stall-holders calling their wares in the square. The one that surprised me most was an old fellow with a brazier selling off portions of fish and chips. “No time spent in waiting for drinks”, he called. I did not quite understand the drift of his sales pitch – maybe, today of all days, he was giving the drinks away free or, at least, speedily, while they were still piping hot. I was delighted to see in one corner of the busy square a man selling secondhand books. Tomes of various sizes were spread around him on mats, some huge purple encyclopaedias and entrancing little matching volumes no doubt containing rare fictional gems. I could not wait to get my hands on them. My attention was temporarily drawn by the others in my party to the fact that some of our fellow guests at the house had turned up at the same place, evidently also confused by the shut-down garrison and the undependable maps of the area. They were haggling with a shopkeeper at the entrance to his open-plan emporium. From this distance I could not actually discern what he was selling and indeed what they were buying. They had not yet noticed us. My mother must have been among them since I could hear her voice right across the square. At the same time, I spotted Auntie Enid wandering through the crowds in another part of the square. SHE was not staying with us for Christmas, so it was surprising to see her as lost as the rest of us. If I recall correctly, Auntie Enid was a relation that everybody seemed to acknowledge, but nobody knew exactly who she really was. The nature of her relationship with the rest of us was to remain a mystery of the tenable universe. She bore an uncanny resemblance to the Queen. I waved at my mother to point out the whereabouts of Auntie Enid, but she had evidently already seen her and decided that it was impractical to leave the others to make herself known. My mother had not yet seen me. By the time I turned back to the secondhand books, the man had already cleared them away, surrendering any hope of likely customers on Christmas Day, and scarpered, mats and all, whilst the going was good. One of my children was by now tugging at my person, pointing eagerly into the blue sky. Why I took it for granted, I do not now understand, but I was not surprised to see that the child was indicating a peculiar-looking flying craft. It seemed like a huge piece of electrical equipment, one of those components sold in shops which I always thought were for experts or, at least, for people who were clever with their hands. It spread its spindly wings on ratchets, even as I watched, its insidious roaring making most of the people in the square to block their ears. It was buzzing very close to the tops of the buildings and, as it careered towards us, I saw it was literally enormous, bigger than a jumbo jet. Then, from another quarter of the sky, there came another monstrosity like a floating steel works complete with chimneys and silos. It must have crept up on us, unawares, for I now only noticed its crescendo of booster-engines for the first time, as it thundered close above our unprotected heads, blotting out the sun for more than just a nonce. The two craft darted off together as if they were playing tag, towards what I took to be the direction of Colchester; and we could now view them as smaller contraptions, emitting bumble bee noises as they made flirtatious sorties over the Essex marshes. As they gathered speed to make a re-approach to the outskirts of Bulstrode, the roars sporadically returning to our ears, they clipped wings: it was an accident, I was sure, but my husband said they were fighting. How he knew, I have no idea. In fact, I had no time to question him, for the two craft scattered apart, cartwheeling out of control, and with a pair of ill-timed skull-cracking crashes they made a messy landfall elsewhere in Bulstrode, beyond the unsuspecting rooftops. Thickly plaited plumes of dense smoke streamered into the sky. And I cried. I still do not know why I cried, but it seemed the most appropriate thing to do. I then saw that the shop where my mother had stood with the others was in ruins, evidently collateral damage of the engagement. My mother was never to know about my duplicity with regard to the turkey stuffing. We drove home in silence and convoy, easily finding the way. My husband was missing. One of my children was hopefully with him. Unaccountably, Auntie Enid was with us. I cannot remember much of what happened when we returned to the house, but I certainly now felt selfish in having kept that job of potato scrubbing all to myself. For one fleeting moment, I thought there was a faintly shimmering halo above Auntie Enid’s head, as she dished up the food. I cracked myself open a cold beer. It would soon be time for the Queen’s Speech. 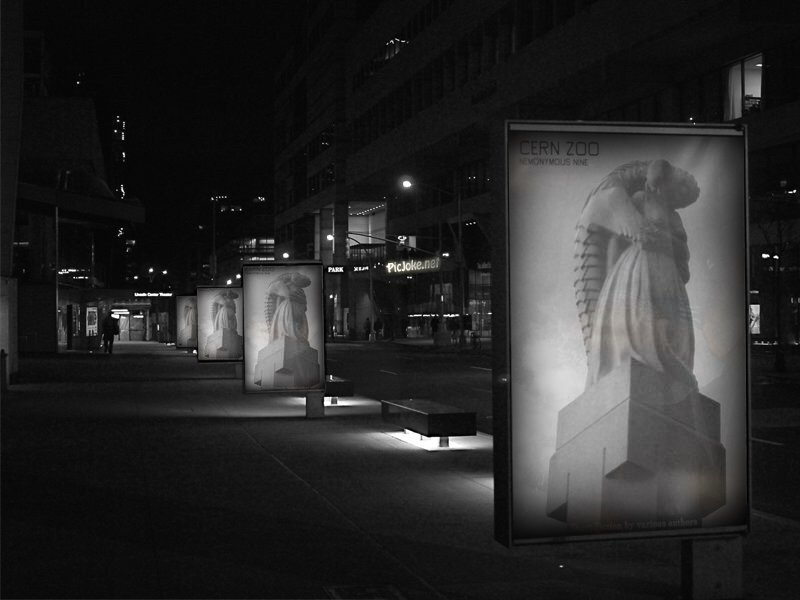 “Nemonymous Night is fantasy at its most unreliable and thought provoking. 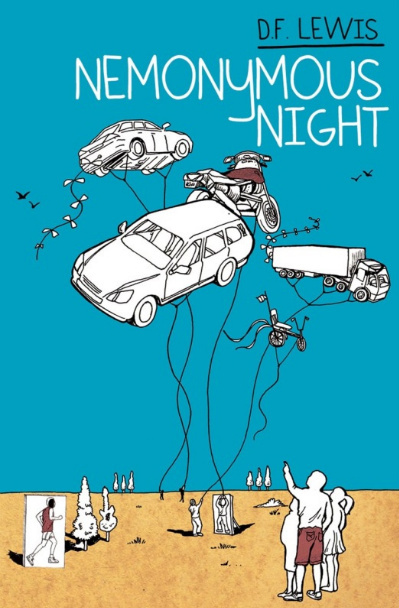 Chômu Press have informed me that Steve Duffy won their free prize draw for a copy of the ‘Nemonymous Night’ novel. I imagine their official announcement will be made shortly, if not already. Thanks to all of you who entered. Below is a picture of the prize together with the extra-mural NEMONYMI that I threw in for good measure. I’m proud of all my Quirk Classics linked above. Including ‘Nemonymous Night at the Earth’s Core’ by DF Lewis and Edgar Rice Burroughs. Meanwhile, what is the symbol between section breaks in the NN book itself, that I originally thought was an apple core to represent the earth’s core? The publisher has now told me. And it’s not what I thought! 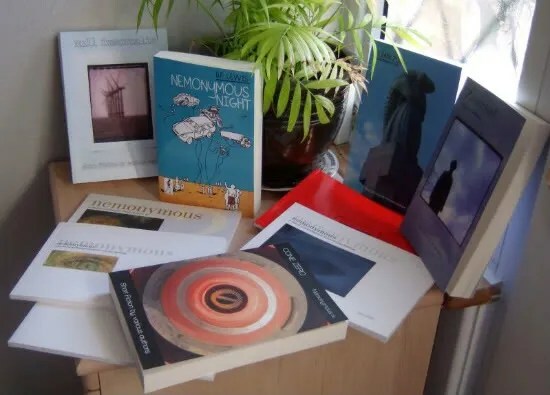 As an extra-mural incentive to the winner of the Chomu Press prize draw ( http://chomupress.com/news/are-you-nemonymous/ ) for Nemonymous Night, I shall also personally donate a complete set of the nine Nemonymous anthology books (2001-2010), signed by myself.